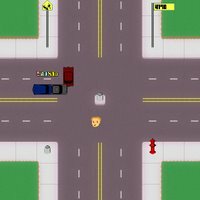 Jaywalker: Take Back the Streets is the sequel to dessgeega's original release, featuring updated graphics and a new soundtrack to accompany your bloodthirsty quest for revenge. Gameplay is essentially the same. Jump in front of a car to make it swerve, hopefully causing it to crash into another object for major points. Chain car crashes to score a multiplier bonus. Hummers and vehicles with spoilers will not attempt to avoid a collision with the protagonist.